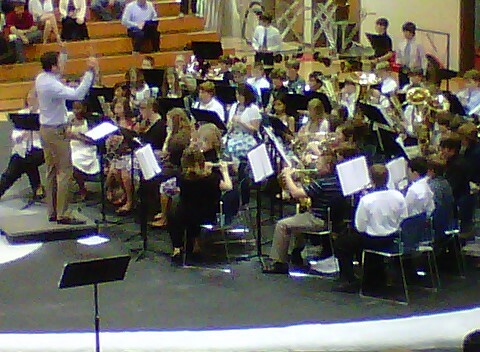 I’m sitting at Rachel’s middle school waiting for her band concert to begin. These things bring back so many good memories for me. Some of my fondest memories from middle and high school are from my time spent in the band. I remember the anticipation the night of the concert. We had put so much time into preparation, and when the night of the performance rolled around we just couldn’t wait to get started. I know my parents really didn’t enjoy my concerts (especially those from elementary and middle school), but they attended them all. I personally enjoy attending Rachel’s concerts greatly. I’m glad she loves music and has a passion for learning her instruments. She is very talented, and I hope one day she will be sitting at one of these concerts reflecting back on how much she enjoyed it.